St. Louis City and the surrounding areas have a rich masonry history. This renowned heritage is attributable to the dedication of the mason contractors and the skilled craftsmen of Bricklayer's Union Local No. 1 of Missouri, and Laborers' Local Unions Nos. 42, 53, 110 and 660. Chartered in 1896, the Mason Contractors Association of St. Louis is one of the area's oldest construction industry trade associations. 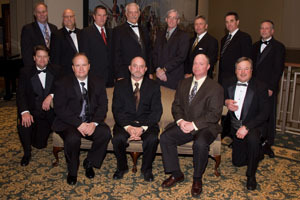 Its members are classified into two basic groups: 1) Contractor Members are the owners, principal partners, chief executive officers or senior management officials of firms engaged in contracting masonry construction; and 2) Associate Members are firms and individuals that supply and support masonry construction, representing such divergent business interests such as traditional manufacturers and distributors of masonry materials and supplies to firms serving the financial, legal and business needs of the industry. Feel free to browse around our site and contact us with any comments or questions you may have.